Why Do We Listen to Dummies? Ventriloquism isn’t an auditory illusion. It’s social. 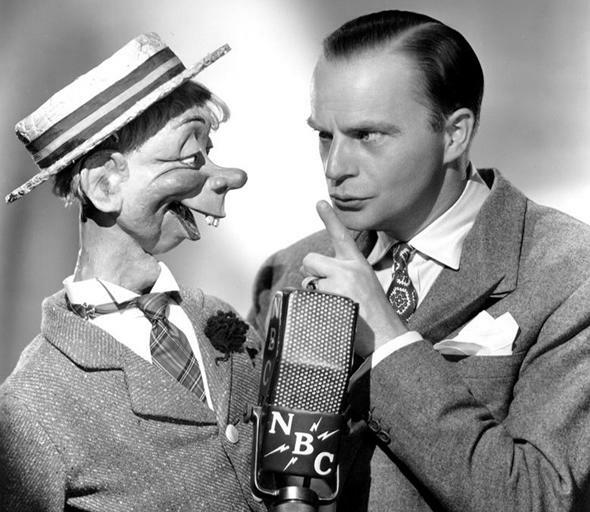 Ventriloquist Edgar Bergen with Mortimer Snerd from the Chase and Sanborn Hour. Your brain’s system for directing attention is what makes you think a puppet has a mind of its own, Michael Graziano told me. He is a neuroscientist at Princeton and author of Consciousness and the Social Brain. He is also a novelist and composer and writes children’s books under the pen name B. B. Wurge. How did you get into ventriloquism? It wasn’t to make some scientific point. I actually started because my son wanted his toy animals to talk. He demanded it frequently, so after a number of years of intense practice, I got better at it. Tell us about your puppet. He’s called Kevin and he is a talkative, impish orangutan. Interestingly, the things he thinks of I can’t think of unless my hand is in there. Obviously, in my brain, I have generated a model of a personality that gets projected onto Kevin. He comes up with all kinds of outrageous comments. For instance, I once introduced him as a cute fuzzy orangutan, and then he blurted out that he’s Darth Vader—in that voice. What point do you want to make with Kevin? When we attribute mental states to other people, it’s not just about intellectually figuring out what someone else might be thinking. That’s part of it, but there is a gut intuition part too. That’s the point I’m trying to make. With a ventriloquist’s puppet, you know intellectually that there is no awareness, but you can’t help experiencing the illusion. The social attribution is automatic. Do your audiences get the point? They get it, because the ventriloquism illusion is so potent. Many people think it is a visual-auditory illusion—your voice sounds as if it’s coming from the puppet’s lips. But the real illusion is social. What do you mean by a social illusion? When I speak through a microphone on stage, the sound is coming from speakers elsewhere. It looks as if it’s coming out of my mouth, because it’s time-locked to my lips. It’s a visual-auditory illusion but nobody gets excited about that. When the puppet starts talking, it’s the same thing. So, it’s not the visual-auditory illusion that makes ventriloquism exciting, but the social illusion, the feeling that there is another mind in that body. The brain also builds models. To control the body, the brain has a body schema—a model of how the body is moving through space. So, similarly, to control its own attention properly, the brain ought to have a model to monitor and make predictions about the consequences of paying attention. This model is what I call awareness. Once that is in place, the next evolutionary development is to use the same brain machinery to model other people’s attention. That’s where we get into attributing awareness to others. And that’s where Kevin comes in?